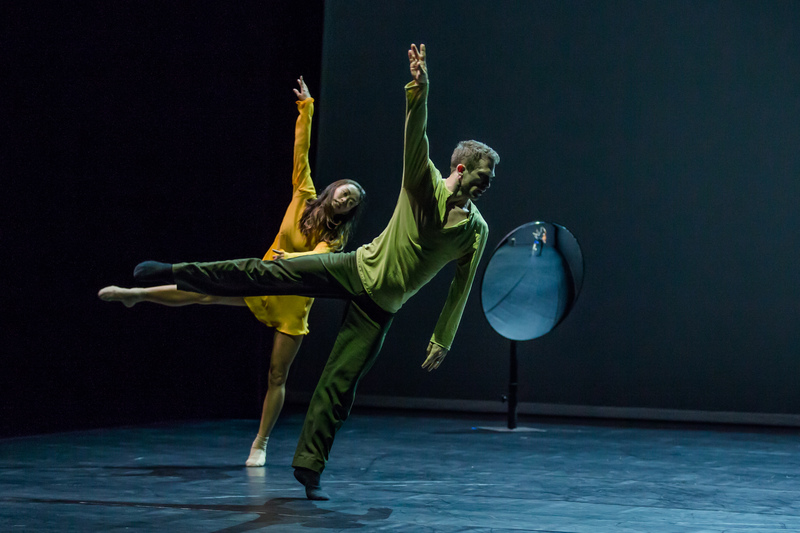 It’s a big deal for Sydney Dance Company to have been granted the rights to William Forsythe’s Quintett. Only six companies in the world have been allowed to perform it – and SDC’s exhilarating performance shows why they are one of them. Created by Forsythe in 1993 as a tribute to his wife, dancer Tracy-Kai Maier, who died of cancer at age 32 without being well enough to see it, Quintett is a contemporary classic for five dancers. Choreographed to Gavin Bryars’ hypnotic Jesus’ Blood Never Failed Me Yet, it is performed on an open set with a spotlight pointed at a round mirror standing on stage. Forsythe blends balletic and contemporary movements in constantly surprising combinations that take the breath away. Traditional ballet steps are deconstructed and twisted off their axis. The dancers whip and whirl around each other then fall, slide and crawl. Sharp, precise movements melt into organic shapes, with some playful floor work. Intensely physical and technically demanding, the opening night cast featured Chloe Leong, Jesse Scales, David Mack, Cass Mortimer Eipper and Sam Young-Wright – all of them sensational. Quintett radiates the sheer joy of movement but is also tender, fleetingly angry and sad. It’s sublime. Quintett features alongside a new work for the full company by SDC artistic director Rafael Bonachela called Frame of Mind, which lends its name to the double bill. It too excites with the visceral thrill of extreme physicality, and is also one of Bonachela’s most moving pieces. The work was inspired by the emotional turmoil Bonachela felt when his mother was hospitalised in Spain and he was unable to be with her. At the same time, he was without the support of his partner who was in New York. Frame of Mind features a beautiful set design by Ralph Myers: a “memory room” with peeling walls and a large, grimy window, through which Ben Cisterne’s evocative lighting suggests the passing of time. Dancers occasionally gaze through the window, perch on the sill, or loll against the wall watching the surging movement of other performers. At times, the patterning on the wall seems to hint at a world map: far-flung places beyond the confines of the space. Myers also designed the all-black costumes. Bonachela uses a wonderful, pulsing score by Bryce Dessner featuring three compositions written for the world-renowned Kronos Quartet. Matching the energy of the music, Frame of Mind comprises a series of solos, duets, trios, quartets and full ensembles where the movement coalesces into moments of powerful unison. Frame of Mind is all about relationships: our need to love and be loved, to support one another and be supported. Highlights include a duet between Jesse Scales and Richard Cilli full of conflicting emotions in which they confront and comfort each other, and the concluding, emotionally-wracked solo by Eipper.